Thank you for your public announcement of your support for equity! I would like to properly address your questions during our meeting last Friday, July 16th in your district office in my attempt to further elucidate the case of equity for Filipinos and provide an educational tool for your fellow legislators and the American public as we further gather support now for your anticipated sponsorship of a bill on January of 2011. Thank you for your public announcement of your support for equity! I would like to properly address your questions during our meeting last Friday, July 16th in your district office in my attempt to further elucidate the case of equity for Filipinos and provide an educational tool for your fellow legislators and the American public as we further gather support now for your anticipated sponsorship of a bill on January of 2011. I will discuss the issue on a question and answer format. I hope that this will aid in the understanding of the issue in the context of the political condition three months before and after the passage of the law in February, 2009 and now in July, 2010 that the lump sum money is almost depleted. Question: In the books of Congress, who opposed the lump sum benefit inserted in the American Recovery and Reinvestment Act of 2009? Response: In the books of Congress, none. Legislators like Cong. Filner and Sen. Inouye were equity advocates before. They offered a lump sum instead—something that was never demanded by the pro-equity groups. 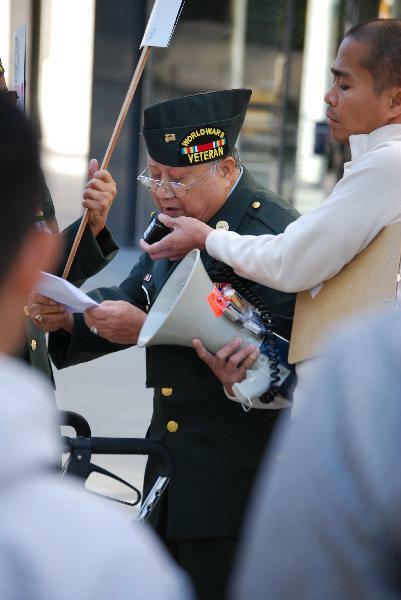 In the books of the Filipino-American community, Justice for Filipino-Americans (JFAV) and Veterans Equity Center (VEC) did oppose the lump sum. As a community-based organization of marginalized veterans and widows that barely survive on social security, JFAV made a tough decision of not endorsing the lump sum in public but at the same not directly opposing the passage of the bill in Congress. The average age of veterans is 88—way above the life expectancy of 78 for Americans. For many veterans, they feared that they may die anytime and that accepting the lump sum regardless of many conditions, was the best thing to do. There will be veterans who out of extreme necessity have to concede to the lump sum bill when approved. JFAV will respect the decision of these veterans as long as they understand that they can accept, but with a stamp of political protest. Others will wait and see. Some will reject the lump sum even if offered. Collectively, JFAV stands to fight for full recognition and lifetime pension benefit. We will stand united as we are until we attain justice for the veterans, the widows and the Filipino people. JFAV used to be part of the lobby group, American Coalition of Filipino-American Veterans (ACFV). The JFAV leadership in writing and in internal phone conference with other ACFV members in the US expressed its deep opposition and frustration over the lump sum bill. When JFAV felt that ACFV would totally support the lump sum in every way, JFAV bolted away and presented its case to the Filipino-American community. Question: Why does JFAV oppose the lump sum? 1. The basis of the eligibility is the Missouri List regarded as the official list of US Army personnel.- This is reconstructed list as the original list was burned down in 1973 and we believe that as much as 80% of the US personnel list from 1912 to 1960 was affected, making the list very arbitrary. The lump sum appropriated only for 18,000 veterans in the US and the Philippines . If the data is accurate, how come a year after the lump sum was approved, the DVA received 41,000 applicants? Even if one factors in any possible duplication or application by ineligible widows, the number is still way too high to be reconciled with the original estimate of 18,000. Does it make it sense as to why currently, as much as 42% of the 41,000 applicants are denied? 2. The lump sum provided $15, 000 to US citizens and $9,000 to non-US citizens- Why would current citizenship be a basis of the lump sum and not the actual military service? If two soldiers, white and brown in color, both fought in Bataan and survived the Death March and defended the same US Flag and US territory, why would one get a bigger pay than the other? Besides, at the time of the war, Filipinos were US nationals being colonial subjects of the US . Ironically, the other 66 nationalities like the British and the French who also fought under US command during WW II were never US nationals. And yet, they have been receiving the same treatment as American veterans! 3. The lump sum is a payment for “human suffering” and not full recognition of military service.- Nowhere in the text of the lump sum would you find a passage that the military service of the Filipino WW II veterans is deemed ACTIVE military service to the US . The word “recognition” in the text was used exclusively, for the purpose of issuing the lump sum. 4. The “quit claim” clause- The lump sum comes with a section that says: “the acceptance by an eligible person of a payment under this section shall be final, and shall constitute a complete release of any claim against the Unites States by reason of any service.” This precludes the Filipino-American veterans the right to claim future benefits. This is not a language used in treating the other 66 nationalities who served the US . Questions: Are there documents to prove that JFAV indeed showed its opposition around the time the lump sum was deliberated upon until its passage on February of 2009? 1. Letters of Protests- Refer to the letters circulated in the emails, publications and flyers. Known letters were written by Atty. Arnedo Valera, JFAV legal counsel and executive director of Migrant Heritage Commission (MHC), Arturo Garcia, national coordinator of JFAV and myself in response to newspaper editorials. 2. Book entitled “Unrecognized American Veterans- Memory, History and Equity for Filipino WW II Veterans” written by Arturo Garcia and edited by Peter Cuasay, Ph.D.
3. Video at Balitaang America- During the year-ender show of 2009, the producer and the whole crew of the Balitang America decided to read an open letter to President Barak Obama reflecting the sentiment of the Filipino community on various issues affecting the community like education, housing and World War II veterans. At the height of the lump sum debate, the Filipino- American community demanded full recognition, monthly pension and family reunification! 4. Mass Actions- On November 10, 2008, veterans and widows gathered to protest the lump sum and reiterated call for equity. On December, 2010, the Association of Widows, Advocates and Relatives for Equality (AWARE) was formed partly in response to the fact that most widows were excluded in the lump sum. Several meetings occurred in UCLA and UC Law School in SF denouncing the lump sum. Youth and activists in New York also organized meetings to vent out opposition to the lump sum. Refer to the book for documentations. I am sending a copy of the book to your office in San Mateo . Refer to Chapter 6, entitled: “A Victory Without Equity, The Struggle Evolves.” Book signing was done in the cities of LA, San Diego , San Francisco and soon Seattle , New York and other key cities. As for the video, you can access that in the You Tube. Look for Filipino-Am letter to Obama or simply click http://www.youtube.com/watch?v=GJx15W5_Zyc. Question: Is JFAV, the Filipino veterans and the Filipino-American community reneging from its contract when they accepted the lump sum and after two years demanding pension benefit from Congress? Response: No. The 5M Filipino-American community will not make the same mistake as the US Congress when in 1946, it passed the Rescission Act, which in effect reneged from its promise to the veterans as outlined in the GI Bill in 1944. As previously explained the lump sum was grossly unconstitutional, unfair and discriminatory. The Filipino-American community has all the right to seek redress and redemption from the US Congress that stole justice from them first in 1946 and second in 2009 with the passage of the lump sum. You never renege from a bad law. The burden to fulfill promise or prior legal commitment lies in the US Congress. Question: Is the Filipino-American community confused whether to demand equity or more lump sum money? Response: No. We clearly demand full recognition and equity above all. This is a choice between the right thing versus an easy thing. After 70 years of injustice and discrimination, the US Congress has the responsibility to make things right. By restoring the full dignity of Filipino-American World War II veterans as legitimate American veterans deserving of equal rights and benefits from the enactment of the equity law until death, we can make a closure of the issue that has deeply wounded Filipino-American community for years. In addition, this will also redeem the credibility of the US Congress as an institution that can render justice to people. During the counter-attack of the US against Japan close to the end of the war, the US was caught in a dilemma between bypassing the Philippines and attacking Japan right away or liberating the Philippines first before attacking Japan . General Douglas Macarthur against the advice of the US President and the US Cabinet insisted that the Philippines must be liberated first. He won the debate and liberated the Philippines first, thus saving 10,000 American Prisoners-of-War, who would have been massacred had the US went straight to Japan . He chose and did the right thing. Much like the General, Congresswoman Speier, you are in the right position and at the right time to correct history and do the right thing for us your people. We clearly demand full recognition and equity above all. This is a choice between the right thing versus an easy thing. After 70 years of injustice and discrimination, the US Congress has the responsibility to make things right. By restoring the full dignity of Filipino-American World War II veterans as legitimate American veterans deserving of equal rights and benefits from the enactment of the equity law until death, we can make a closure of the issue that has deeply wounded Filipino-American community for years. In addition, this will also redeem the credibility of the US Congress as an institution that can render justice to people.